I play tanks. Prior to playing tanks (end of BC and forward), I played a healer(early BC). Prior to that, I played a dps (all of vanilla). Why all the switching? Well, I saw a need, and jumped up to fill it. I had a decently fun time playing my rogue in Vanilla, but got burned out on the raiding scene right about the time my guild was a good ways into AQ 40. I took it easy and just chilled until BC released, where a group of friends and co workers all decided that we would make our own guild. We had a tank, we had dps. We had no healer, so I created my paladin and healed my fruity elf cheeks all the way through the first raid dungeon, where guild problems and frankly just lack of skill by the rest of the group stalled us out. What is the end result? I loathe healing. The guild stopped playing and most everyone quit. I decided I wanted to start playing again for the wrath release, and the rest of the guild sorta followed suit. Except this time, I wanted a tank. So I made a death knight and leveled it up 80. The only other tank we could find as a guild also happened to be a death knight. I didn't think this would be the best raid make up for the group, and we didn't have any other tanks, on top of me not completely understanding the mechanics of DK tanking at the time led to me once again dusting off my paladin. The guild was actually successful this time, and we had accomplished all of the current raid content that was available prior to Ulduar. Right before that, though, I once again got completely burned out on my paladin. Guild drama ensued and the group fell apart once again, and I stopped playing. A few months go by and I think it would be fun to play the game with my wife, and actually get her through the two expansions we paid for, but she never saw. This time around, though, I resolved to play what I wanted, and be more relaxed about everything. And it worked, too. I'm happy as a clam now, on my new server. 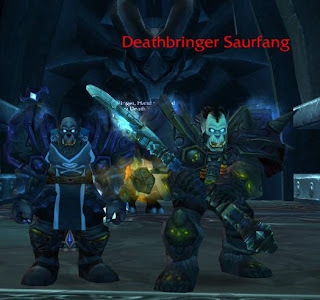 I have a good group of people that are doing weekly 10 man raids, and I get to play my death knight tank, which I am really, really enjoying playing. I'm in a role I enjoy, playing the class I enjoy, and doing content that is enjoyable and challenging, with my wife! The moral of the story is, find the class you like, find the role you like, and stick to it. There's a lot to accomplish in warcraft, and finding the right character can help you stay happy and motivated in the game. And beyond that choice, find a guild where the people share your goals. And just for fun, here's Soul and his new buddy. I've also been playing around with some other classes. There's a Tauren Hunter that's hovering around 12 right now. He's kind of stuck, since I've not made up my mind which direction to take his talent track -not to mention what pet to acquire- but I found him slightly slower in leveling compared to a Paladin like Quint. Part of that could be starting out in Mulgore as opposed to Eversong, but I also think that part of it is the nature of the Hunter to balance melee with ranged attacks. The talent tree and the pet only have just come into play, so I'm not sure how it'll take off until I reach 20-25 or so. I'm not going to bother talking about my Priest, since that was my first character and I hadn't really a clue how to play at all. Heck, I thought Priest = Cleric in D&D parlance, and it took me a good day or so to figure out that wasn't the case. In addition to that, I really didn't understand talent tracks and kept taking stuff all over the place and not sticking to one particular track for most items. The guy is straightened out about that now as a Shadow Priest, but rather than going back and redoing that initial leveling, I'm just going to keep going with him when the mood strikes. Most recently, however, I've been playing around with a Blood Elf Mage. Maybe it's my experience at leveling, the class, or a combination of both, but she's been rocketing up the track like lightning. (Yeah, a she. So what? Souldat thinks Blood Elves are feminine anyway.) After about 2-3 hours, she was already at 10th level and climbing. Tack on another 2-3 and she'd probably be at 15th level, but I'm going to try to keep her Enchanting/Tailoring up to her leveling speed. A Mage is a bit different compared to a Priest or a Hunter; the Mage has more offensive spells than the Priest and can hit from distance -like a Hunter- but for more damage. Just don't get in a slugfest, otherwise you'll lose. The mage does have some outs for that with polymorph and frost nova, but you have to learn to use them. I've still got a lot of "just run up and hit the damn thing" in me, so I have to remind myself it's okay to freeze them, back up, and hit them again from distance. What do I think of the other classes? If I get the Hunter down, it's the ultimate soloing class with a built-in companion; it still lacks healing capabilities of a Pally, which the way I play I tend to need healing a bit. I doubt it's quite the best companion for running a 5-man, because I could see the pet drawing aggro away from the tank at the wrong times. If done well, however, it could be a great ranged asset in a 5-man. The Priest? Well, I'll get back to you later on that guy. He's still recovering from my noob mistakes, and we'll get there when we get there. The Mage? ::rubs hands together:: Power... I like power... Seriously, it can be a fun class to play for blasting your way to fame and profit. I used to think that Souldat's wife -a mage- was nuts for running through a trash mob and freezing them along the way, but I can definitely see the appeal having done it once. The healer in me is appalled ("dude, let the tank do that!") but I can see how the spellpower of the mage can give you that feeling of invincibility. Right now, Quint is still my main character, but I know eventually I'll settle him in the garage and take him out for rides only occasionally. I might just see what this mage can do, and maybe she'll take over in the lead-in before Cataclysm. As you can see in the post below, I was getting rather frustrated with the current situation on my server. Well, in frustration I hit the official forums for recruitment adds that would sound promising. They're advertised as a relaxed guild with "mature" members, that raids content at a relaxed pace. Well, they messaged me and said myself and the wifey got accepted and to just drop them a note when I arrive on their server! So, after letting my favorite paladin know about this, I made my preparations and said goodbye to old Stromscale, and the name Kriegtrommel. Kriegtrommel is a mouthful, and I wanted something simpler. A new beginning on a new server deserves a new name. Souldat is born. My first night in my new guild consisted of getting my mods set up again, doing a few random heroics with some of the officers (just by chance). Which was good, because it proved I'm not a drooling git smashing my face on the keyboard and hoping thing die. I only get like that when I pvp. So, after the second random heroic, they dropped group and said it was raid time. They asked if I wanted to attend as well, and I jumped on the opportunity. Off I headed to raid the home of Arthas. And you know what? I killed his first obstacle, and claimed my prize! I'm sporting a fancy new sword! The exhilaration of killing a boss in an encounter you've never done before just can't be matched. And the thing that made this particular fight special, was the number of times we died before the boss did. We tried roughly 7 or 9 times before the boss finally died. And the officers of the guild that were in the raid group stayed relaxed and pleasant. They did not get all up in arms and start yelling about what people did wrong. They calmly explained the particular mechanic someone misunderstood and took another crack at it. It is such a relief to know that my money spent on a server transfer seems to have been well worth it. Do I really NEED to advance my gear to do any of this? No. If I'm doomed to a life of running heroic dungeons and PUG raids, my gear is good enough. So what's the point? I really like gearing up my tank, making him the strongest possible character to tackle what ever dungeon or raid I can get into. Tanking TOC 5 man for the first time was a trip. Facing the cries of the elitists telling me my gear is too bad, my health is too low. But, I've always risen to the occasion, and was able to hold my own. However, I'm actually pretty frustrated, now, with the situation. So find a guild on your server, start PUG raids, or start your own guild you say? Firstly, the server I'm stuck on currently is a west coast server. I'm an east coast kinda guy. Why am I on that server? Blizzard screwed me. My original east coast server was so packed after the game launched, they opened transfers off the server to a lower population server. So instead of facing a line of 45 minutes to even LOG IN, the wifey and I jumped ship and moved on over. Which, was not a big deal, as a LOT of others did the same thing. As a result, we had a decent balance of east and west coast players. This does not seem to hold true anymore. I've been hitting the server forums every day at lunch looking for recruitment posts, and all of the guilds posting do raids until about 1am my time. Uh.... right. Why don't I start PUG raids? I'm not that brave. I am a supervisor at work and I don't want to have to do the same thing in the game I choose to play to relax. Why don't I start my own guild? I have. I used to game with a bunch of guys from work. I only play with one guy now, because he said he was bored and wanted something to do during the winter. I'm actually relieved I no longer game with them, as that led to nothing but DRAMA. And as stated previously, I'm a supervisor at work. I don't want to have to be a babysitter in the game I play to relax. All I want is a guild that actually has the capability to do raids together and a chance to even SEE the content I'm paying $15 a month to miss out on. I have the sinking feeling, though, I will not find this on my server. 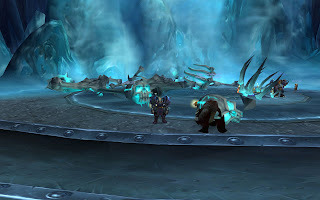 Seeing as it's patch day and I'm currently watching a progress bar inch to the left, I thought I'd finally write up a post I had been meaning to do ever since getting my Quel'Delar. I mean to capture a whole slew of screenshots to tell the tale of Krieg and his Quel, but I got wrapped up in the quest at different points and forgot the print screen button. I did manage a few shots though, and you see these after the jump!